New South Jordan Fire Chief Andy Butler (right) is sworn into office by City Recorder Anna West, as friends, coworkers and family look on. 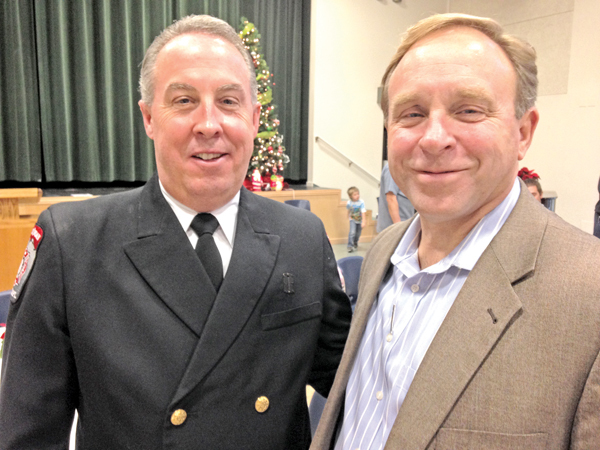 Chris Evans, who has been South Jordan’s fire chief for 13 years, has hung up his hat. He said goodbye to friends and coworkers at a retirement dinner on Dec. 12, and is now looking forward to less stress and more time for travel and family fun. Evans’ wife, Diana, works for West Jordan City, but when she’s home with him she already notices a difference in her once-busy husband. Evans’ 31-year career actually began in West Jordan in 1983 as a part-time fire fighter. He was promoted to a full-time public safety officer in two years. He served in many positions while in West Jordan, including patrol officer, SWAT medic, fire lieutenant and fire captain. One major impact he had on the department was when he became the first full-time training officer and developed and used a 13-week recruit training academy. This included an in-service training program and a firefighter safety and survival course. He made the move to South Jordan in the fall of 2001, where he went to work devising and implementing new programs as the operations battalion chief. Between grant writing, developing the city’s SWAT team, managing the hazardous materials and technical rescue teams, Evans also found time to put together victim advocate and emergency management programs. “He did a really good job and had a lot of innovations,” firefighter/paramedic Sean Hines said. In August 2005, Evans was promoted to deputy fire chief, and six months later, he became fire chief. During his tenure as chief, he developed state and nationally recognized programs such as putting AEDs in new and existing business and offering free AED and CPR training. “He left an unforgettable mark on this community,” City Manager Gary Whatcott said. The once on-the-go fire chief now holds a toy phone at his side, which is a big difference to the two phones he carried with him day and night. “This is a first in his career that I’ve never seen him with one or two cell phones by his side,” his wife jokingly said. New Fire Chief Andy Butler was sworn in at the Dec. 16 city council meeting and said that the transition to his new role has gone smoothly so far. “We’ve been lucky because we were able to work together for a while,” he said of former Chief Evans. Butler’s career started with the Draper City ambulance team in 1995. He also worked with Salt Lake County Fire Department. He joined the South Jordan Fire Department in 1997 as a part-time employee, and in 1999, he went full-time. Butler has also held a variety of positions such as SWAT medic, hazardous material tech. grant writing specialist. He also worked in public outreach programs and did recruitment and hiring work. One of Butler’s biggest challenges will be to accommodate the future growth of the city and of the fire department. Butler’s family is adjusting to his new position, knowing that more of his time will be taken up at work. His wife Brooke and 5-year-old son Hudson, along with family members, looked on as he took his oath of office in the city council chambers on Dec. 16.